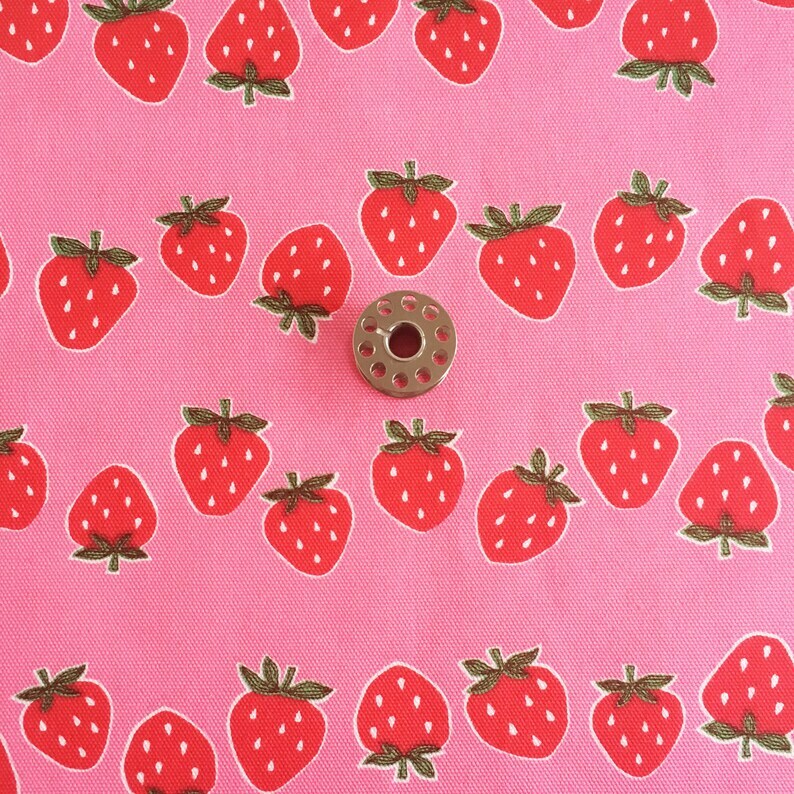 REMNANT PIECES Strawberry stripes on pink Japanese cotton Oxford sewing fabric. (2) remnant pieces of a Japanese cotton fabric from Cosmo. This is oxford fabric, which is a light weight cotton canvas fabric. The background is bubble gum pink. You'll receive both pieces shown in second and third photos. All together they are about 24% of one yard of 42" wide fabric. The larger piece measures 13" at the widest point x 24" at the highest. The other measures 5" high x 20" wide. This fabric has been laundered in unscented laundry soap. Item is wrapped in brown kraft paper and tied with colored twine. Comes with a OOAK handmade patchwork card with your note typed and included in card. FAT EIGHTH Tiny Happy Lucky Cherry Print Fabric: Small piece of bubble gum pink fabric with small scale cherry fruit print. Tiny Scraps: 1 Ounce bag of small quilting cotton fabric scrap pieces for postage stamp quilts, patchwork, fabric beads. Blue Fabric Pieces: Small pieces of a variety of blue fabrics to use for patchwork, doll clothes, or other small craft projects. Rose Pincushion Cuff PDF Sewing Pattern (Digital Delivery): Instructions to make a bracelet pin cushion to wear while you sew. Grocery Bag PDF Sewing Pattern (Digital Delivery) : Beginner friendly sewing project to make a grocery tote bag in three sizes. Intro to Improv Zip Pouches PDF Sewing Pattern (Digital Delivery): Sew lined zip top storage bags in five sizes. Grocery Bag PDF Sewing Pattern (Digital Delivery): Beginner friendly sewing project to make market shopping tote bags in three sizes. Super fast shipping. Love the fabric! Owl Coin Purse PDF Sewing Pattern: Sewing tutorial to make a coin purse change pouch. Etsy Checkout payments can experience delays up to 48-hours for security screening. If your payment is selected for security screening, your shipment will be delayed and PDF patterns will not be available for download until the payment clears. You can also pay with PayPal. Sorry, no eChecks, money orders, cash, or bank transfers. Digital documents can't be returned, so there are refunds or exchanges for patterns. Please download, save, and store your pattern file(s) somewhere safe (i.e. not on your computer). Lost files can be replaced for 30-days with proof of purchase (link to your receipt, or a copy of your email receipt). I don't sell, maintain, or store these documents indefinitely so if you lose your pattern in many cases it is irreplaceable. If you want to keep these files indefinitely--or at least longer than your next computer crash or upgrade--the best option is to have a data backup system running, or store the files online. Storing them online can be as simple as emailing them to yourself at a gmail type account, or using a service like Drop Box or Box.net. Sorry, no refunds for items cut or made to order. This includes custom made buttons, fabric, interfacing, and any other items cut as continuous lengths the buyer specifies. • Returned items must be in original condition. • Shipping fees are not refundable. This includes the costs to ship it back and the original shipping cost you paid when submitting your order. • Make sure to mail it back with "Delivery Confirmation" or some kind of tracking. This is to protect you should the package go missing in the mail. A refund isn't submitted for processing until the return package is received. • Return package needs to be post marked within 30-days of your purchase. • Once your package arrives a refund will be submitted within 48-hours. The time it takes to actually receive the refund credit in your account can vary. Questions regarding those processing times should be directed to etsy or your bank. Shipments within the US are sent with "Delivery Confirmation". Please let me know if you have not received your package after 2 weeks. USPS online tracking information must show the package has not been delivered in order to qualify as a lost package. All PDF patterns are delivered via INSTANT DOWNLOAD. Once your payment is processed you'll receive an email from etsy with a link to the download. You can also download your file by going to "Your Account" --> "Purchase" --> then select the invoice for the transaction. Patterns can not be downloaded through the Etsy phone app. All sewing supplies ship via the United States Postal Service (USPS). Unless otherwise noted, your package will be shipped 2-3 business days after your payment is received. I don't ship packages to destinations outside the US at this time, but you can use an international mail forwarding service to get a US mailing address and they'll forward your packages to you. Google "international mail forwarding" to find companies that offer this service. Please credit Michelle Patterns in all written item descriptions. For example when selling online please include the following sentence, or other similar wording in your item description: "This item was made using a michellepatterns.com sewing pattern." A link to my etsy shop would also be greatly appreciated. All items for sale must be handmade by you. Contracting with others to mass produce the designs is expressly prohibited. Distribution of the pattern pieces and corresponding instructions is expressly prohibited. Keychain Clutch Mini Wallet PDF Sewing Pattern (Digital Delivery): Sew a mini pouch to use as a small wallet or card case. Large Oval Eyelet: Nickel plated screw together large grommet. Messenger Bag PDF Sewing Pattern: Make a women or mens' messenger bag with two pockets and adjustable strap. Passport Pouch PDF Sewing Pattern (Digital Delivery): Sew a two pocket pouch to hold up to three passports. Mending Kit PDF Sewing Pattern: Intermediate sewing project tutorial to make a padded pouch to use as a sewing kit or for other storage. Business Card Wallet PDF Sewing Pattern (Digital Delivery): Quick to make a two pocket pouch to use for business card case or mini wallet..
Zip Pocket Pouch Wristlet PDF Sewing Pattern: Intermediate sewing project to make a small or large wristlet with two pockets.